Managing your network and ensuring every device is adequately protected can be a complex and costly task. 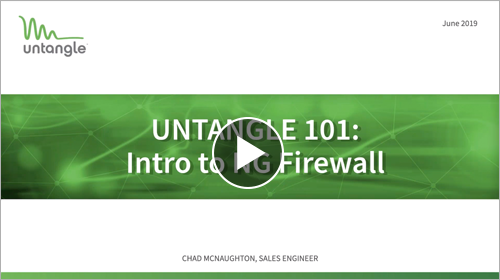 Untangle NG Firewall simplifies network security with a single, modular, software platform designed to fit the evolving needs of your organization. Designed specifically for organizations with limited IT resources and budgets, NG Firewall provides a browser-based, responsive and intuitive interface enabling you to quickly gain visibility into the traffic on the network. 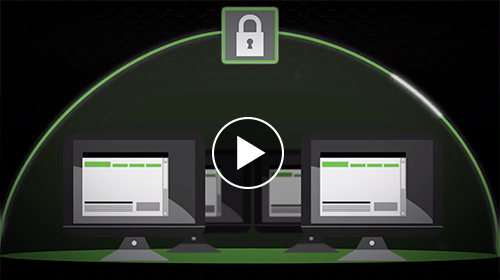 From content filtering to advanced threat protection, VPN connectivity to application-based shaping for bandwidth optimization, NG Firewall delivers a comprehensive, enterprise-grade network security platform for organizations in any industry. Proactively stop malware, hacking attempts, phishing schemes and other threats before they reach users’ devices. Gain insights in real time from database-driven reports without the need for a separate appliance. 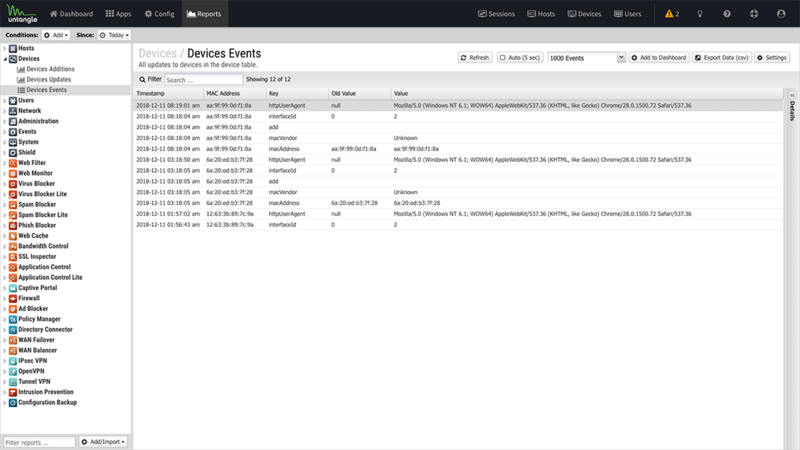 See the network status at a glance on the dashboard, ensure compliance with full event logs, and get notifications of network anomalies or unusual user behavior with alert rules. 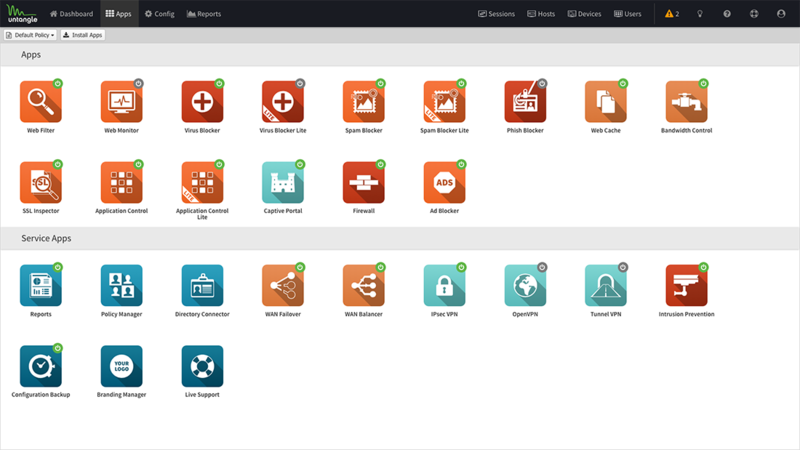 Untangle Command Center gives you visibility into all of your NG Firewall deployments and the ability to access them remotely from a single login and central management view. Zero touch provisioning makes it easy to deploy appliances without physical access. Configure and push policy templates, create global alerts, view real-time information on hosts, and initiate an endpoint security scan. Get a handle on every rogue application, encrypted web request, malware distribution point, drive-by malvertising attempt, and rash of spam. Meet the challenges of a remote workforce, branch offices and guest Wi-Fi. Keep users and data safe regardless of location or level of access. Balance competing priorities, ensure Quality of Service (QoS) and maximize uptime while saving the organization money. 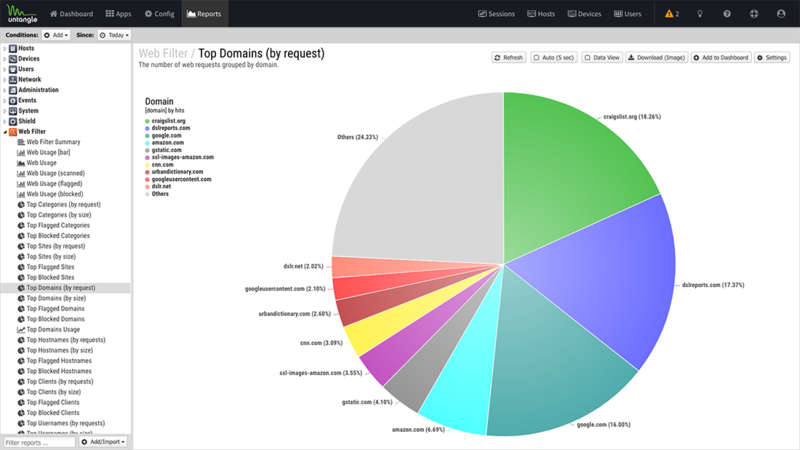 ScoutIQ™ cyber threat intelligence aggregates anonymous telemetry information across files, URLs, and IPs observed across NG Firewall deployments and performs detailed threat analyses across all traffic types seen on today’s networks, providing a second layer of defense and superior protection against unknown and emerging threats. These screenshots show the interface of NG Firewall in action. 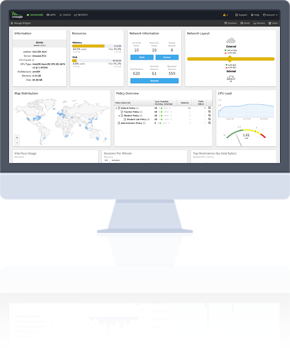 The Dashboard provides an overview of the state of your network at a glance. 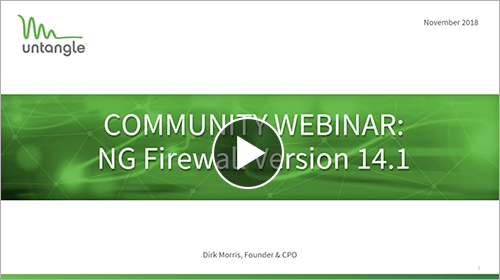 It is extremely useful for quickly viewing what is happening on the network and getting the current status of the NG Firewall server at a glance. By default, the Dashboard will display several widgets showing different information. 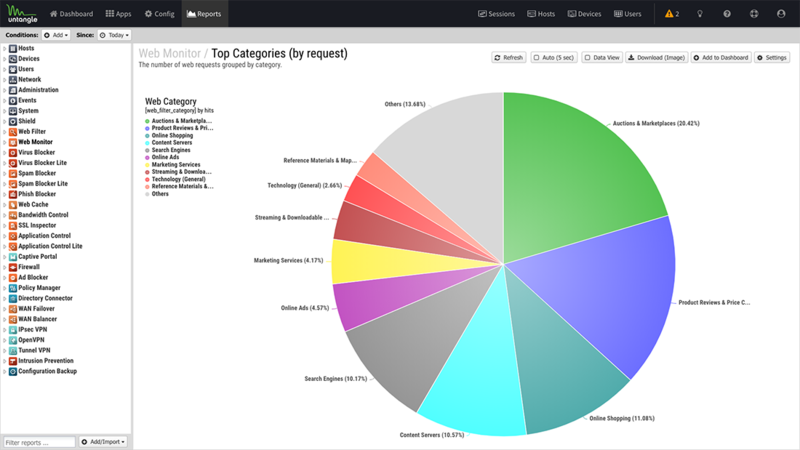 However, the Dashboard is completely customizable. Widgets can be removed and added so the administrator sees exactly the information that is important to them. The Reports navigation makes it easy to find the information you need. View individual reports and navigate through the Reports app on a tablet or phone. Proactively block malware, phishing, spam, hacking and other exploits from reaching users and devices on the network. Ensure network performance and bandwidth for your organization’s business-critical cloud apps. Maximize uptime and QoS to increase productivity and minimize recreational traffic. Get a handle on every rogue application, encrypted web request, malware distribution point and rash of spam. Maintain visibility and control over remote workers, branch offices and guest Wi-Fi. Keep users and data safe, no matter their location or level of access. Create policies by user, group, device, time and more to control who can access websites, data or apps. 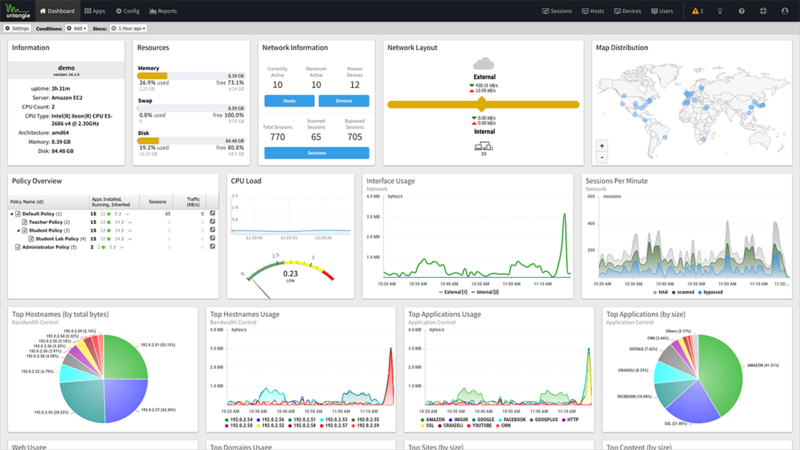 Get complete visibility into and control over network traffic. Get expert help from our tech support team. Rebrand NG Firewall to reflect your brand in the administrative interface and on block pages. Check out our Current Release page for more information about the latest version of Untangle, including point releases.